Moist forests and thickets; swamps (both coniferous and hardwood), especially along borders; peatlands; fields, fencerows, ditches; often in disturbed areas in forests and swamps, as along trails and in clearings. An old collection from Keweenaw Co. (O. A. Farwell 732 in 1889, BLH) would be suspiciously disjunct and is not mapped. 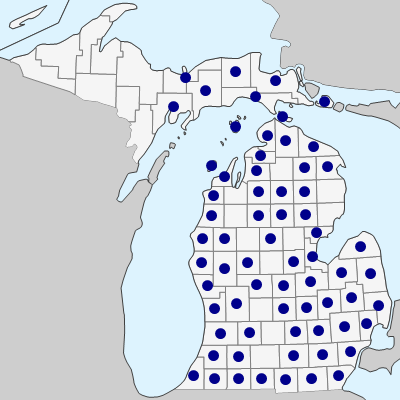 No one else has ever collected the species that far west in the Upper Peninsula. Leaves are relatively thin and flat (not very rugose) in the var. rugosa. Variety aspera (Aiton) Fernald has leaves strongly rugose (with veins sunken, as viewed from above, or raised, as viewed from beneath, the surface thus appearing pitted or like hammered metal). Both occur throughout the range of the species in the state, and appear to intergrade somewhat. Very rarely, the stems are completely glabrous below the inflorescence. 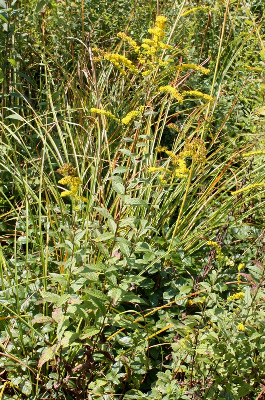 Such plants would key to S. ulmifolia, but can generally be distinguished if they possess most or all of the following characters: lower leaves smaller than the middle ones, leaves scabrous-hispidulous above, achenes strongly antrorse-strigose, rays 6 or more per head, stems arising from elongate rhizomes. In S. ulmifolia (which is also an upland forest understory rather than a more wetland plant), lower leaves are somewhat larger than the middle ones and often coarsely toothed, leaves usually have long straight often appressed hairs on the upper surface, achenes are short- and/or sparsely pubescent, rays are 3–5 per head, and stems arise from a thick perennial base, without elongate rhizomes. An apparent hybrid between this species and S. uliginosa has been found. MICHIGAN FLORA ONLINE. A. A. Reznicek, E. G. Voss, & B. S. Walters. February 2011. University of Michigan. Web. April 19, 2019. https://michiganflora.net/species.aspx?id=467.